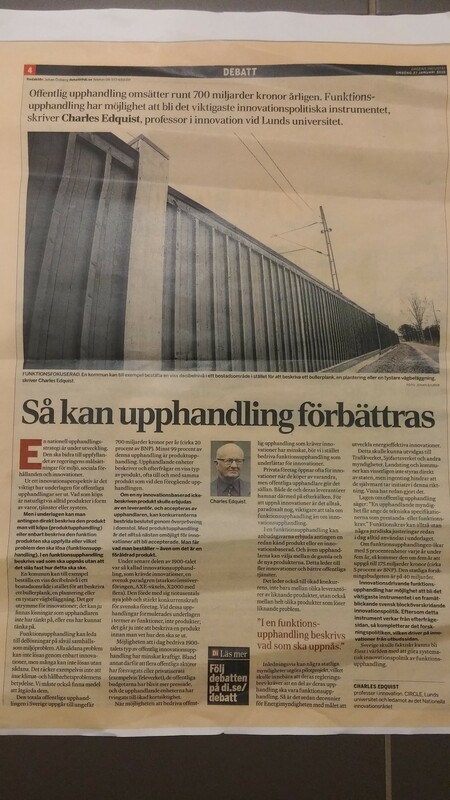 The Swedish daily economic newspaper Dagens Industri published, on January 27, a debate article entitled ”This is the way procurement can be improved” (in Swedish). It is focusing upon ‘functional’ or ‘problem-based’ public procurement. One of the key sentences is: “To enhance innovations it is, paradoxically, more important to talk about functional procurement than about innovation procurement.” In the article, I also relate functional public procurement to innovation policy as a whole. I argue that functional procurement can become the most important instrument in a future-oriented Swedish innovation policy. Since this instrument works from the demand side, it supplements research policy that operates from the supply side. In this way functional procurement can contribute to Sweden leaving the linear model for a holistic innovation policy.